So last week I welcomed me first large group of buyers into our home. It was slightly chaotic. Up until now I have only had one shop, Rubanesque to exhibit at open studio days and never to more than 6 guests at a time. So with two shops, Rubanesque and Exquisite Threads, and a combined inventory of more than 500 items to keep track of, it was a whirlwind. Just before the open studio event, I happened upon a beautiful, battered, wooden suitcase, once owned by a Madame Devaux of 10 Place de la Madeleine, Paris dates 1875. 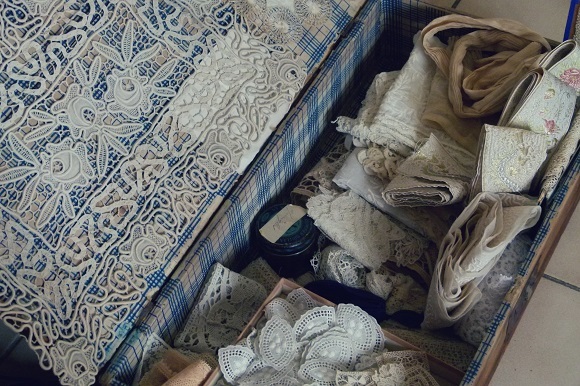 Inside a jumble of laces, slim lace & tulle bands, thicker coarser linen needlepoint, some hints of black tulle peaked out from beneath the miles of muddled thread. I asked the dealer if I could just take a peek through at what was inside the case. It was late in the day, and the vendor was in the process of taking down his stand. He barked a price for the lot, I didn't blink before reaching for my porte monnaie. It was a risk, I didn't quite know what I was getting. At the least a lot of jumbled up old lace fragments. ....but, there was always the chance, the promise of something special buried beneath it all. I drove like a maniac to get home and once settled on to the sofa, my beautiful antique wooden suitcase before me, I dove in. I carefully threaded each piece of individual lace around my finger, putting aside those that I could use a jewellery making project I've been planning and those that I might consider selling to the right person. Underneath the fragments lay wonderful treasures, a 1920s silk fringing for a lampshade, an incredible hand embroidered floral applique (see photo above), pretty hand embroidered "Faust" handkerchiefs, an old tin full of pins, a set of delicate wedding handkerchiefs, some tiny Point de Venise appliques, and a fabulous black silk & lace cuff (just the one). You can find some of Madame Devauxs treasures now up in the Exquisite Threads store - I'm already suffering pangs of sellers remorse!